1: Pound garlic and a pinch of salt to a fine paste in a mortar and pestle. Add rosewater, lemon juice and spices and stir to combine. Place quail in a non-reactive bowl, pour over marinade, turn to coat, cover with plastic wrap and refrigerate to marinate (2 hours). 2: For rose and quince dressing, whisk quince paste and rosewater in a small bowl until dissolved. Whisk in garlic, cinnamon, olive oil and lemon juice, season to taste and set aside. 3; Preheat a char-grill or barbecue over high heat. Remove quail from marinade, cook skin-side down until golden and crisp (3-4 minutes), then turn and cook until just cooked through (1-2 minutes). 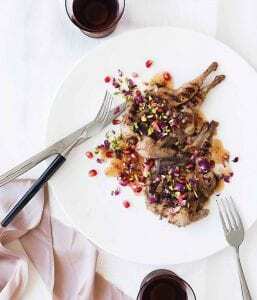 Serve with rose and quince dressing, scattered with rose petals, pomegranate seeds and pistachios.